Dr. Sherman Canapp, originally from Maryland, completed his graduate work at Johns Hopkins University in biochemistry with a research emphasis in surgical and pharmaceutical research. He was the first to complete a combined DVM/MS in clinical science in surgery at Kansas State University. He then completed an internship in small animal medicine and surgery at the University of Missouri, followed by a three-year residency in small animal surgery at the University of Florida. 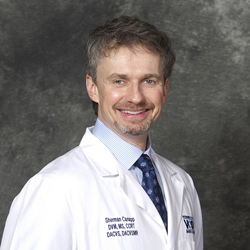 Dr. Canapp is a diplomate of the American College of Veterinary Surgeons, and charter diplomate of the American College of Veterinary Sports Medicine and Rehabilitation, of which he was past president. Dr. Canapp is certified in canine rehabilitation through the Canine Rehabilitation Institute. He is a consultant for numerous pharmaceutical and medical devices companies, and veterinary and medical schools, as well as working and performance dog organizations. His particular area of interest and current research lies in regenerative medicine for the treatment of soft-tissue injuries and osteoarthritis, treatments and modalities for sports-related injuries, and minimally invasive surgery – specifically arthroscopy. Dr. Canapp has extensive experience in developing and testing orthopedic and arthroscopic devices, implants, and systems, as well as validating and testing regenerative medicine systems and protocols. In 2015, Dr. Canapp established Project GO (Global Orthopedics for Animals). Project GO is a non-profit foundation dedicated to helping animals with musculoskeletal injuries from working dog government organizations, rescue organizations, wildlife organizations that have significant budget constraints. In 2014, Dr. Canapp established The VOSM Academy, LLC educational training programs for veterinarians in the areas of sports medicine, regenerative medicine, rehabilitation therapy, diagnostic musculoskeletal ultrasound, arthroscopic procedures. The VOSM Academy Certification Program was then created in 2015 to allow practices and individual clinicians trained and certified by Dr. Canapp to become a VOSM affiliate member. Locations currently certified or in training include Philadelphia, Seattle, Finland, Japan and Australia. Dr. Canapp lectures nationally and internationally on these topics, and teaches advanced courses in sports medicine, arthroscopy, and regenerative medicine. Dr. Canapp is also co-principal and chief of staff at Veterinary Orthopedic & Sports Medicine Group (VOSM), where he routinely receives referrals for sports-related injuries, arthroscopic procedures, and regenerative medicine treatments from domestic and international sources. Dr. Canapp is also the President and CEO of Orthobiologic Innovations LLC, where he is actively engaged in concept and product design and development for orthopedic and arthroscopic devices, instrumentations, biologics and regenerative medicine technologies.